Take advance of the ease and simplicity by uploading your digital files to create your own framed art on a canvas gallery wrap. We have simplified the frame selection process by narrowing the frame choices. The frame selection consists of only three styles of float frames. Experience has taught us that these three work best for gallery wraps. These include the basic colors: Black, Walnut, and White. Our high quality canvas wraps have a solid-faced backing which makes them different from the conventional stretched, open back canvas prints on the market. The solid-faced canvas wraps we sell come with a sealed back to keep out dust and insects. The wraps have tight corners and the canvas will not sag or buckle. The canvas wraps come with hardware, ready to hang. The canvas printing method uses premium artist-grade canvas and custom-developed pigments with UV protection. The protection resists fading and scratches for a lifetime of enjoyment. First, be assured you are receiving the best quality for the price when it comes to printing on canvas. The patented process behind our gallery wrap prints results in a completed product that won’t warp or sag with time. The wrapped canvas products, both framed and unframed, are designed to stay taut and flat. They hold up through the roughest of life’s every day pokes and prods. 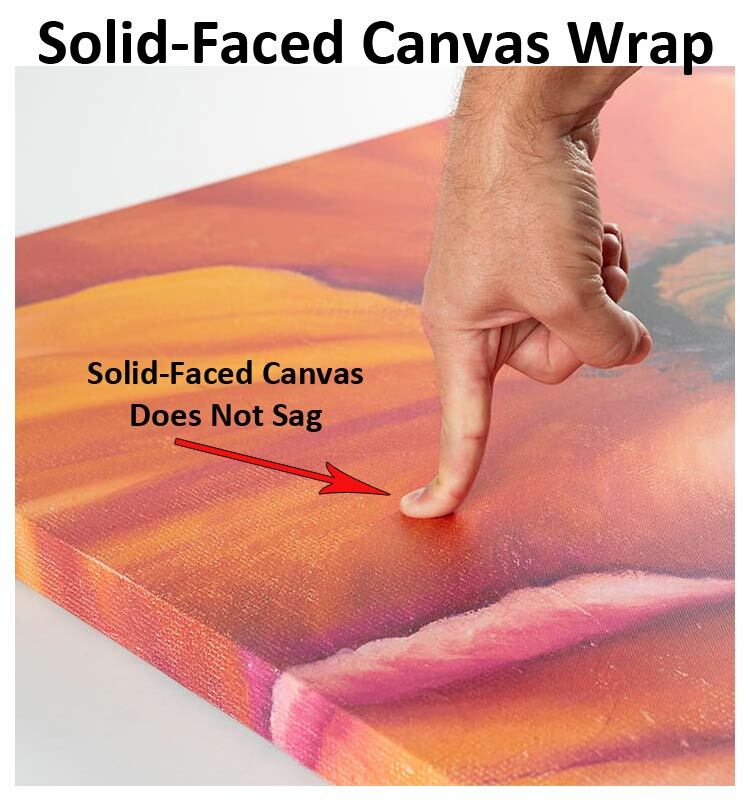 You can literally push on the front of our solid-faced canvas prints and they won’t warp or sag. Although they hold up to a reasonable amount of pressure, don't put all your weight on the front of a canvas. The reason our canvas wraps hold up so well is because they are a solid-faced canvas wrap specially mounted on hard, high-density wood fiberboard. Furthermore, sizes 16x20 and larger come with protective polystyrene foam. This protects the canvas both inside and out. Adding to a crisp clean look are the tight corners on our canvas wraps. It is not only the front and sides that have a crisp clean look, but the back has a great look too. Unlike conventional stretched canvas that is stapled with an open back, ours is different. Our backs are sealed using a patented process. The process assures the tight corners, guards against dust and against insects getting behind the canvass – which a traditionally stretched canvas permits! Attractiveness and durability are high priorities for us. It is for this reason we only use the highest quality canvas products. This assures us we will have reliable durability, image clarity, and color accuracy in the completed product. Inks are another key essential component in canvas durability. The inks used to print our canvas wraps and un-stretched canvas products have an archival rating to prevent fading. In addition, the special ink and canvas combination preserves as much fine detail as possible with no over-saturation or color shifting in the completed image. Our canvas is certified artist grade material, and it is OBA-free to ensure quality and accuracy. Each framed gallery wrap comes with its own hanging hardware. The first option for gallery wrap prints is to have them framed. To simplify the online framing process, we have narrowed the frame selection to three basic colors. We offer online float frames in Black, White, and Walnut finishes. Each of these frames is about 3/8” wide. They are made of 100% recycled plastic and look like a wood product. 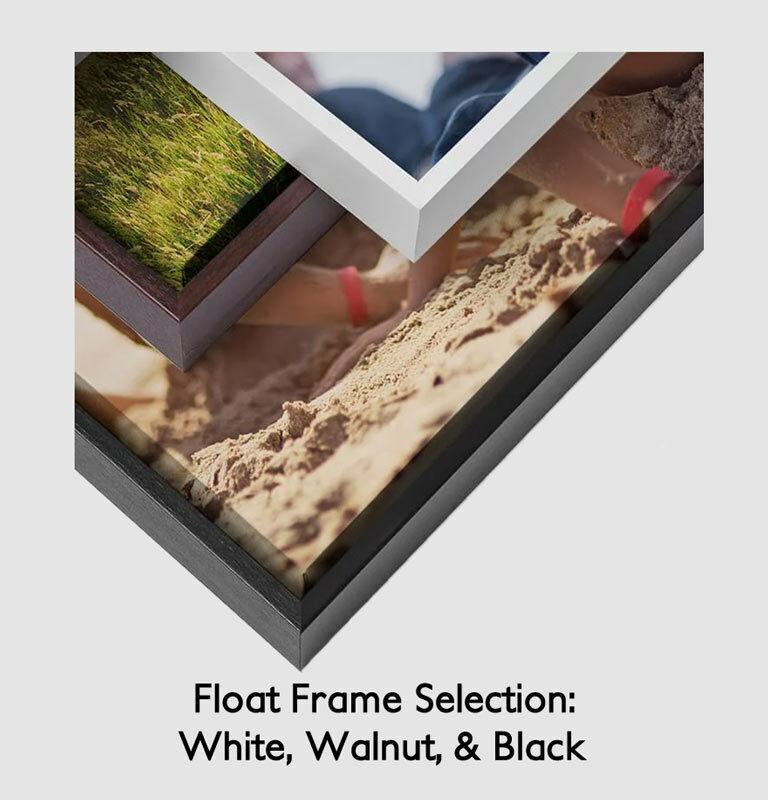 The section on float framing allows you to upload your image and select a float frame. Click on this link for uploading and framing using a float frame. If your tastes are for an ornate framing alternative, or even a rustic look, we offer a far wider selection of framing options in our shop. 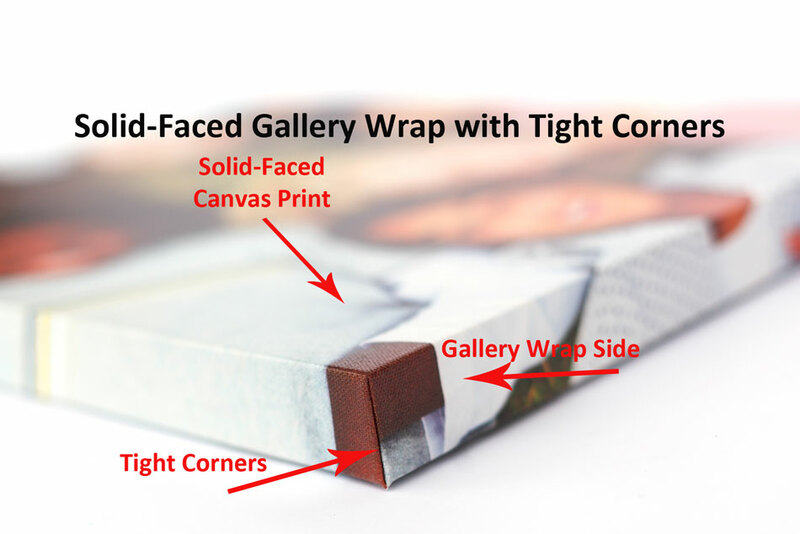 The second option for wrapped canvas prints involves the basic canvas gallery wrap. The selection for four styles of wraps include: white sides, black sides, mirror sides, and the museum wrap. You can click on the link here to upload your image to begin the canvas wrap process. A final option for printing and framing canvas is to simply have the image printed on canvas. We offer un-stretched canvas prints in our photo print section. You can follow the link to upload and print on canvas by clicking here. However, un-stretched canvas will require addition work in order for it to be framed. So, if you prefer something other than a gallery wrap, we can mount the un-stretched canvas on a special canvas mounting board. This will allow the mounted canvas print to be framed with a wider latitude of framing options than the float frames offered on this site. We invited you to stop by our shop at 10070 Ford Avenue, Richmond Hill, GA to discuss framing options. Or feel free to call us at 912-756-2781. All wraps are store pick-up with about 2 weeks processing time. Please click here to upload images files for float framing wraps.